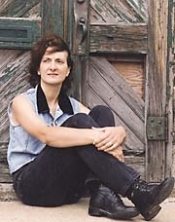 Drawing creative inspiration from surroundings, Mary Ann Rossoni carves edgy soul-deep images with her lyrics, earthy vocals, and punchy acoustic guitar. Her latest release, Downcity, sets down 14 tracks touched with harmonica, mandolin, fiddle, and wood flute. The album debuted at number 20 on CMJ New Music Report’s Top 200 Adds Chart. Now a high-mileage bandleader, songwriter and singer, Rossoni was born and raised in Johnston, Rhode Island where “it was tradition to finish Sunday dinner and go jam in the parlor … I’d sit at the piano.” But all of Rossoni’s musical heroes played guitar, which now defines Rossoni’s folk-rock sound. And that signature sound works extremely well across diverse venues. From coffeehouse to club or festival. Rossoni delivers to the room and always draws requests. National media praise followed her 1998 release, Half Slips & Garters. Earlier, Rossoni co-produced two albums as part of the duo, Fuzek-Rossoni, and took Best Female Vocalist Honors in the 1998 Phoenix Best Music Poll. While Downcity is logging national airplay on over 100 stations, Rossoni can keep doing what she loves doing: writing and performing music that listeners can relate to. Enjoying artistic support and multi-album contract with Wall Street Music, don’t expect Rossoni back in the parlor anytime soon.